In terms of central heating controls, weather compensation technology offers an energy efficient alternative to a traditional timer and thermostat set-up. The technology works by using changes in the outdoor temperature to ‘decide’ how warm your radiators need to be. So if it’s a cold morning, your boiler will initially work harder to produce more heat. As the day warms up, your boiler will ease off so the radiators cool down. With weather compensation technology, your central heating system will be switched on all the time instead of being controlled by a timer and indoor thermostat. This might sound less energy-efficient, but in fact, the opposite is true! This is because your boiler isn’t working hard to heat your house from a cold start once or twice a day, after being switched off for a prolonged period of time. Instead, your central heating controls will react to constant, but gradual temperature changes in the outside world, enabling heat to be provided consistently and efficiently to your home. The boiler won’t constantly click on and off once the room where the indoor thermostat is located gets to the required temperature – a process known as cycling. As Worcester Bosch Accredited Installers, Warm for Life are proud to supply and install high quality Worcester Bosch boilers and central heating controls. The Worcester Wave Smart Control offers the very latest in weather compensation technology, using a wireless internet connection to track live, local weather data rather than using an outdoor sensor. There are lots of other benefits to choosing the Worcester Wave, too. 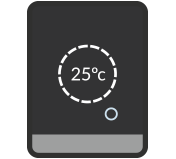 Using a free, downloadable app, you can control your central heating and hot water using your smart phone, tablet or laptop from anywhere in the world. You can track your gas use and spot where you could make savings. And of course, you can programme in times and temperatures for your central heating and hot water if you want to. For more information about weather compensation technology and the Worcester Wave, contact Warm for Life today.